Nature condenses to start anew, how about you? The exuberance of summer is folding in on itself. Condensing into an array of gorgeous and exquisitely designed fall seeds. Now, these perfect little seeds settle back into the humble dark earth. Pause. Exhale. All life begins in the dark. Here the seeds wait, holding a clear vision of their future form. Waiting. Winter solstice comes, and the soft light stirs the seeds. They stretch. Yawn. And begin a slow and steady unfolding toward the clear vision they hold inside. Nature condenses to start anew. How about you? This fall is an opportunity to draw into yourself. To hone the crystal clear vision your heart’s desire. How will you unfold next spring? Join my Fall Cleanse and clear the dust off the mirror of your heart. Condense the potency of your heart’s desire until it sparkles like a diamond-seed. Like the sparkling gold of a monarch butterfly’s chrysalis. You are that beautiful, that potent. Why not feel it for yourself? Dreaming provides the template for our unfolding, but monarch’s don’t get anywhere without milkweed. So yes, you’ll learn plenty about food too. By the end of this cleanse, you will be as smart as a caterpillar – which foods help you stay true to your vision, which block your heart, and which will nourish you through the dark pause of winter and into the slow unfolding of spring. 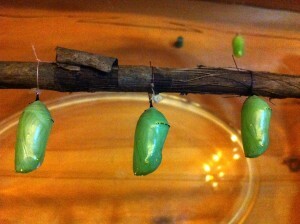 Four of the six monarch chrysalis that we are tending to this fall. Race summary for Fall 2017, or what comes after running 100 miles?